For practicing Catholics, it is customary to place a Nativity scene at the foot of the Christmas tree as the Holidays approach. In the past, according to Augustinians sister’s memories, each department in the Hôtel-Dieu de Quebec Hospital was adorned with a Christmas crêche that included a little Jesus, which was made of wax in the monastery. For the Augustinian sisters, making the wax infant Jesus with red cheeks and baby face has a spiritual importance. It was the communities of nuns (the Augustinians and the Ursulines) who brought the firsts wax Jesus to New France, where devotion to the Child Jesus was already well-anchored, especially among the Jesuits and later the Sulpicians. The oldest wax Jesus at the Monastère des Augustines is on display at the museum. This piece, which dates back to the 17th century, was a gift from those whom the nuns call their “Mothers of France”: the Augustinians of Dieppe. This present, designed in France, likely at the founding monastery in Dieppe, was certainly an act of comfort on behalf of the French Augustinians in anticipation of the first Christmas their sisters would spend in New France; a celebration they had at the house of the Compagnie des Cent-Associés. 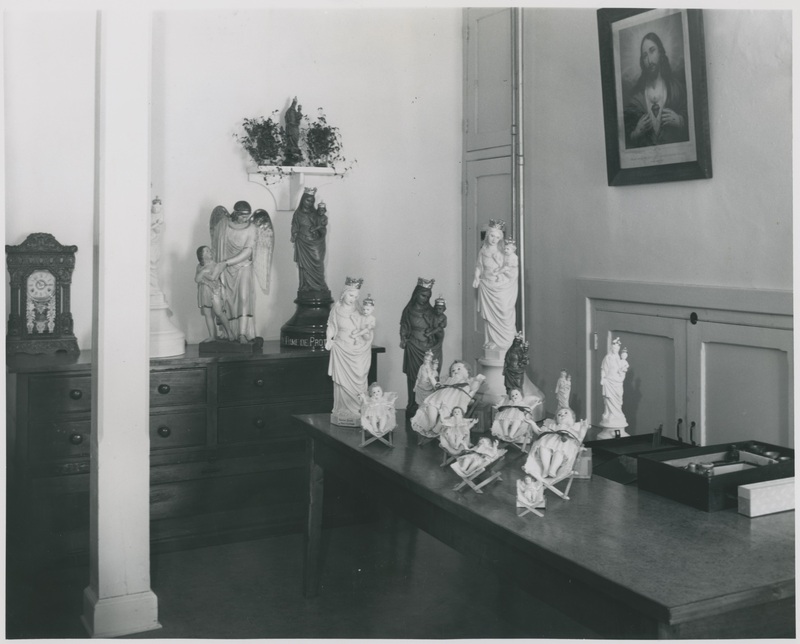 Today, there are about 75 wax Jesus figurines in Le Monastère des Augustines museum storage facility, not counting some figurines preserved by the communities for their own use. 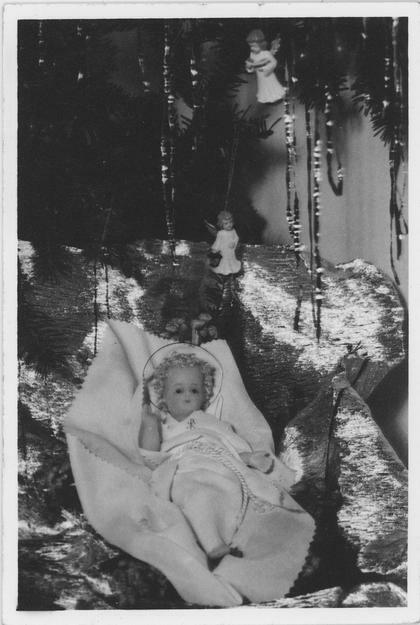 Since the colony’s beginnings, the Augustinians sisters specialized in making the wax baby Jesus figurines, using know-how passed down from generation to generation. There are also tools for their manufacture in the museum storage facility, including plaster moulds, glass eyes, and natural hair that was previously hand curled using a knitting needle. To learn more about their clothing, I invite you to read the article “Les Enfants Jésus de cire: une tradition des Augustines depuis 1639,” on the Fiducie du patrimoine culturel des Augustines website (in French only). 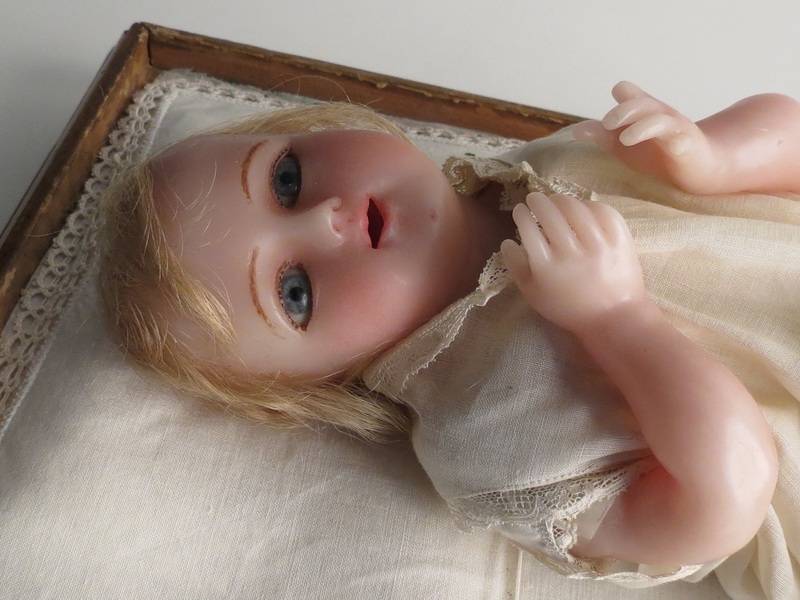 For the “holy craftswoman”, to use an expression from ethnologist Marius Barbeau, making a wax baby Jesus was more than a hobby; it was an act of devotion that had to be done with care. The work must be done perfectly and in Christ’s image. Today, Sister Hélène Marquis, the Saint-Augustin monastery’s Mother Superior, still makes a few wax Jesus figurines every year. As the only member of her community still carrying this tradition, she ensures perfection in every detail of the figurine. The act of making a wax Jesus is not insignificant; while making the doll’s hands, Sister Marquis thinks of the Lord, making sure that “his blessing hands take care to bless all the occupants of the house.” She also ensures that the statuette’s gaze is “peaceful, sweet, and communicating joy.” She makes his legs thinking of people with reduced mobility and wants to ensure that they are “alert and good.” The dolls are fashioned in the image of baby Jesus who was incarnated to save the world; a wax Jesus therefore communicates Christian virtues. Although the tradition of making a wax Jesus is endangered due to lack of succession and sharing knowledge, it is still carried out by the Augustinians. At the Hôtel-Dieu de Québec monastery, a nun sets up a Nativity scene in the chapel at the very beginning of Advent (the 4th Sunday before Christmas). At first, only Mary, the mother of baby Jesus, has an open Bible. Other characters and animals are added as the weeks pass. The Christ child is put into the crib on Christmas Day, along with the three kings at the Feast of Kings. Once completed, the set represents the Nativity scene, one of the founding stories of Christianity, which is the birth of Jesus Christ. In December, visitors taking the museum’s guided tour will have the opportunity to learn more about the holiday season for the Augustinian Sisters. The tour guides will add Christmas and New Year’s information to their regular tours. It’s a wonderful way to combine culture with the festive spirit! Laurier Lacroix, “Les petits Jésus de cire”, Cap-aux-diamants, number 32 (Winter 1993), p. 28-31. Laurier Turgeon (dir. ), Le patrimoine religieux du Québec : entre culture et culturel, Québec, Les Presses de l’Université Laval, 2005, 562 p.
Ariane Robitaille, “Les Enfants-Jésus en cire, une tradition des Augustines depuis 1639”, [online: http://www.augustines.ca/fr/actualites/65] (consulted November 24, 2017). According to a report by Jean-Robert Faucher, RDI, 2003.